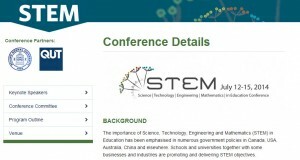 I am very proud to say that I am a member of the Organizing Committee of the STEM 2014 Conference that will be hosted by our Department this Summer. While you can read the information about the conference from its web site, I want to share that we, as organizers, are working very hard to make it interesting, engaging and most importantly, a welcoming place for people to share ideas, learn about Canada and Vancouver and at the same time, form new collaborations. In 2012 this conference was organizers by our colleagues from the Beijing Normal University and in 2010 it was organized by our Australian counterparts (from QUT), so now it is our turn. I am sure we have a great conference and we hope to see lots of teachers, undergraduate and graduate students, faculty, educational researchers and anybody interested in STEM education. If you have any questions, e-mail us. The call for proposals is open and the deadline is December 9th. We are looking forward to receiving your submissions. Posted: 10|18|13 at 7:21 pm. Filed under: Conferences, General, Interactivity in the classroom, Mathematics education, Outreach, Overcoming technology barriers, Physics Education, Science and society, Science Education, Science in everyday life, Teacher Education, Technology and learning. I am a second grade teacher from Southern California. I am very interested in teaching STEAM to my students. I am particularly interested in coming to your conference next summer. Do you think that there will be subjects of interest for me? Anything in biomimicry and STEM? As per my earlier reply, feel free to contact me. I hope you submit a presentation to our conference.